Amanda Winter, 11, visits Santa's North Shore Workshopb to meet Richard Bonnington, who accredits her with his becoming a professional Santa Claus. It started with a Care Bear. In 2003, Richard Bonnington was playing Santa Claus in the Oak Street Playhouse production of "Miracle on 34th Street." One of the children in the cast, Chris Winters, had a younger sister who arrived to see the show. "When she saw me in my Santa Claus costume," Bonnington said, "she just flipped out." Amanda Winters, who was 4 at the time, told Santa she wanted a Care Bear, so he found one among his son's old toys. "I put it in a blue sack, and I took it with me," he said. The next time he saw Amanda, Santa told her: "When I went home to the North Pole last night, I was talking to my elves and my Care Bears, and one of my Care Bears told me he had to come and see you." "When she opened up that sack, her eyes just lit up," Bonnington remembers. Amanda, now 11, said she remembers jumping up and down in delight when she spotted that Care Bear, which she only recently donated to charity. "It was special to me ..." she said. "I thought that Santa was, like, the real Santa and I thought it was extremely important to me because Santa gave it to me." After the next performance, Bonnington recalls, Amanda came back with her parents, toting a backpack nearly as large as she was. • Song: "I Saw Mommy Kissing Santa Claus"
• Memory: Having a 3-day-old baby and a 97-year-old woman on his lap within the same month. "When she unzipped it, the only thing in there was the Care Bear," he said. "She had brought it back to show me that she was taking care of it. Her parents told me that it slept with her. When she took a bath, it was in the bathroom. "I thought, 'If you can have that much affect on a child with a used toy, being Santa Claus is just ... you've got to do it.'" 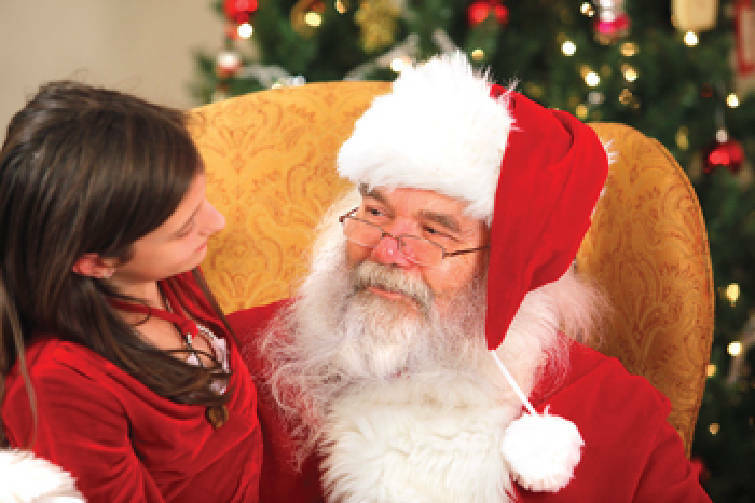 From there, Bonnington volunteered as Santa during the holiday season while working at Unum Provident. After leaving Unum in 2006, he started working seasonal mall positions, spending weeks away from home in Elizabethtown, Ky., and in Anderson, SC. "I didn't particularly care for that," he said. "Being somewhat disabled, it's not the best thing for me to live in a hotel for five weeks. And my wife didn't like me being away for that long." But a temporary separation was better than what could have been. On Dec. 10, 1998, Bonnington was in Tiftonia trying to cross an intersection at Cummings Highway and U.S. Highway 11. "I never saw the truck," he said. According to the Times Free Press archives, an 18-wheeler carrying 20 tons of gravel dust clipped the back of Bonnington's Dodge Monaco, which ended up partially underneath the truck and wrapped around a utility pole. Bonnington's lower body was pinned by the impact. "They say 50 percent don't survive past the first hour," he said, "and 90 percent don't survive two hours." He remembers the official extraction time being recorded as 181 minutes. The accident cost Bonnington his right leg and nearly cost him his left. "I got 12 extra years," he said. "I should not have survived the accident. For a long time, people would say there had to be a reason I survived. And a while back, I realized that reason was to be Santa Claus. I survived to be Santa." Earlier this year, he opened Santa's NorthShore Workshop on Frazier Ave. The shop, he said, provides an opportunity he didn't have as a mall Santa. There's a wall of letters written by children, a door to the elves' workshop and a toy room. "I see more of that magic (here)," he said. "A mall Santa, you're sitting in a chair, the kid comes up and tells you what he wants, you take a picture. You're limited in the time you have. Here, I get up and greet the kids. I give them the tour. I knock on the magic door and invite them to knock. They usually do. They're totally caught up." He wears the red suit and hat, and styles his long, white beard to play the role. "I do have more rollers than my wife," he said. "She says if I don't do that I look like ZZ Top." The whimsical wooden ornaments for sale were created by a woman who died from complications of diabetes. Her family was looking to sell some of her crafts after she passed, so Bonnington, who has juvenile onset diabetes himself, bought the whole collection. The true meaning of Christmas, Bonnington said, is the spirit of giving. "To me, Santa Claus embodies anonymous giving. I think that's the greatest thing about Christmas. To me, the person who gives anonymously is giving a far greater gift than the person who's doing it to get recognition. Gifts should be given without expecting a thank you. That's what Santa Claus is. Because if it comes from Santa Claus, there are no strings." This year, Bonnington is looking forward to just being home for Christmas with his wife, three children and two grandchildren, rather than driving home late from a mall gig on the night of Christmas Eve. He always enjoyed Christmas, but it was his backstage experience with little Amanda Winters that showed him the real spirit of the holiday. "The effect of giving that Care Bear, that's what did it. That was my first real taste of the magic of Christmas." Earlier this week, Amanda, dressed in jeans and a red velvet top, visited Santa for the first time in seven years. As Bonnington and the girl became reacquainted and reminisced about their last meeting, and the Care Bear, Amanda's mother, Shawn, and brother, Chris, now 14, looked on. "She said to me, 'Mom, I changed someone's life,'" Shawn Winters said, her eyes welling up. "I told her, 'Yeah, baby, you did.'"